For the last few weeks, GNC, the dietary supplements retailer, has run a special on its Web site for a workout booster called Jack3d. "Hot Buy, Hot Buy, Hot Buy," reads a red banner splashed across the product's page. Michael L. Sparling, who used Jack3d, died in 2011. Pronounced Jacked, the powder contains a stimulant that marketers say increases strength, speed and endurance. 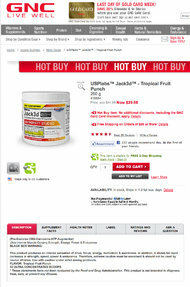 At VitaminShoppe.com, where Jack3d is also sold, a reviewer boasts, "My muscles have gained mass like never before." Yet, last April, federal health regulators issued a warning that the stimulant - called dimethylamylamine, or DMAA - frequently raises blood pressure and heart rate, and could lead to heart attacks. In December 2011, after the deaths of two soldiers who had used Jack3d, the Defense Department removed all products containing DMAA from stores on military bases, including more than 100 GNC shops. "It's a pharmaceutical-grade product which is being directly introduced into the supplement marketplace with absolutely no regulatory oversight," said Dr. Pieter Cohen, an assistant professor of medicine at Harvard Medical School who has studied dietary supplements. In the medical literature, DMAA has often been described as a synthetic stimulant similar to amphetamines that can constrict blood vessels, raise blood pressure and heart rate, potentially increasing the risk of heart attacks and strokes. In 2005, supplement makers began to market the substance in workout and weight-loss products, often combining it with caffeine, which may enhance the stimulant's effects. Products like Jack3d and OxyElite Pro, which USPlabs also markets, became popular among fitness buffs as part of their pre-workout routine. Although USPlabs now makes a new version of Jack3d - called Jack3d Micro - without DMAA, and the products are no longer sold on military bases, the original Jack3d remains widely available at some stores and Web sites. GNC.com said that Jack3d "produces an intense sensation of drive, focus, energy, motivation and awareness." Last week, a reporter bought the original version of Jack3d at a GNC outlet in Midtown Manhattan. Â But a study commissioned by the United States military after the two soldiers died raised red flags about the safety of DMAA products. Â "DMAA in combination with other ingredients may be associated with significant consequences," a team of military, sports and supplement researchers wrote in case reports about the deaths of the two soldiers that was published last December in Military Medicine, the journal of the Society of Federal Health Professionals. The researchers added, "DMAA continues to be available in dietary supplements despite the lack of evidence that it qualifies as a dietary ingredient." Last month, a coroner in Britain cited the stimulant in the death of Claire Squires, 30, who took Jack3d before running the London Marathon last year, collapsed late in the race and died. DMAA "on the balance of probabilities, and in combination with extreme physical exertion, caused cardiac failure which resulted in her death," the coroner wrote in his report. "The F.D.A. 's warning process may do little to nothing to stem the significant public health risk posed by this potentially dangerous ingredient," Philip J. Gregory, an associate professor at the School of Pharmacy and Health Professions at Creighton University in Omaha, Neb., wrote in a research letter last December in Archives of Internal Medicine. Â "It was a drug. That certainly calls into question whether it even fits in the supplement space," Daniel Fabricant, the director of the F.D.A. 's division of dietary supplement programs, said in a telephone interview last week. "We continue to send warning letters." "It is incumbent upon the F.D.A. to make a decision as to whether it is a legitimate and safe dietary ingredient," he said. Â The company has also gone on the legal offensive, using the courts in an attempt to defend Jack3d's reputation. Last October, USPlabs filed a defamation lawsuit against the owner of a supplements store in Reno, Nev., who gave a television interview about Jack3d as part of a consumer safety report on a local news broadcast. Philip Tracy, the owner of Max Muscle of Reno, described Jack3d as an "amphetaminelike compound" that "speeds up your heart rate" and could "possibly" cause death. A judge dismissed the lawsuit, which was filed in federal court in Dallas, for lack of jurisdiction. Â Reached via e-mail, Mr. Tracy declined to comment. 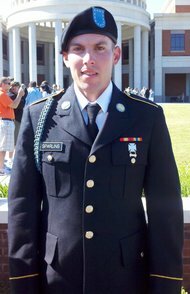 Â The lawsuit filed by Mr. Sparling's parents said that on the morning of June 1, 2011, Mr. Sparling took the recommended dose of Jack3d after buying it at a GNC store at Fort Bliss in El Paso. During a moderate workout with his unit - a short run interspersed with lunges up a small hill - Mr. Sparling, 22, collapsed. He died at a hospital several hours later of respiratory failure and cardiac arrest.Â Anne Andrews, a lawyer for Mr. Sparling's parents, said it was appalling that GNC continued to sell Jack3d. Â "Jack3d is a product with well-established dangers, and the F.D.A. and medical community have made that abundantly clear," Ms. Andrews said. "GNC has chosen financial gain over the safety of the consumer." While this is certainly a sad case. Not everybody will suffer a heart attack from this supplement. Should we ban it? No I say. I take these supplements, and If I die of a heart attack than so be it. I know the risks. Enough with banning everything. I would rather be dead than not get a great workout. It’s enough that epedrine is banned!!!!! !